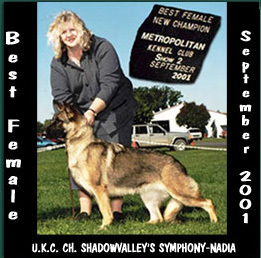 Sire: ShadowValley's Comet Star, C.G.C., O.F.A. Grandsire: SelAmCan. Bredwell of Joelle CD. TC. O.F.A. 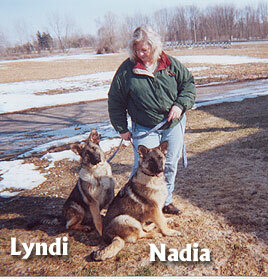 Nadia, pictured at left at 20 months of age, is for sale. Please contact me for details. ShadowValley's Symphony (Nadia) and ShadowValley's Echo V Madolin (Lyndi), pictured at the left at 6 months of age, and both out of Sire ShadowValley's Comet Star, C.G.C., O.F.A. Dam Detmer's Echo Echo Echo, O.F.A., Grandsire SelAmCan. Bredwell of Joelle CD. TC. O.F.A.